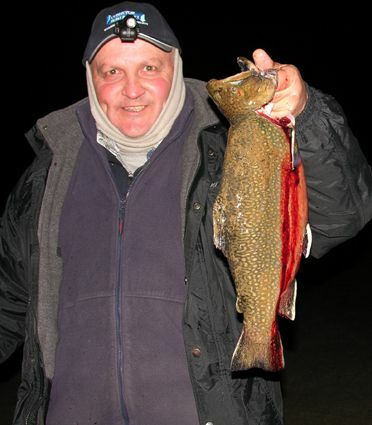 Headlines: Fishing this week and on the weekend was very good. The weather on the weekend was fantastic although the frost in the mornings made for a very cold start. Polaroiding conditions in Jindabyne were near perfect. Trolling was very good too for some but an early or late start was required. 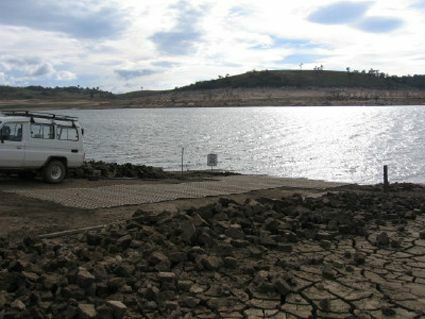 Good rain is forecast for the week and this should stir some more fish into action. 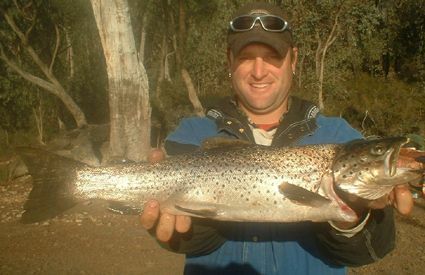 The dam wall has some great clear water at the moment and with the steeper banks you can polaroid some nice fish. Rainbows can start to form in loose schools at this time of year and are a bank proposition in the wall area. 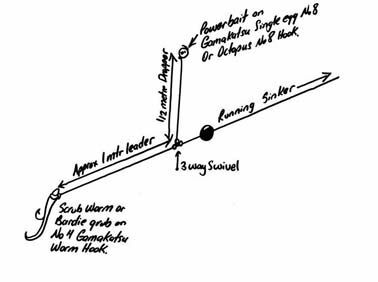 Try using bead head Woolly Buggers in olive and brown, a Bushy's Horror, or a size 10 bead head black or brown Nymph fished with a very slow figure of eight retrieve. 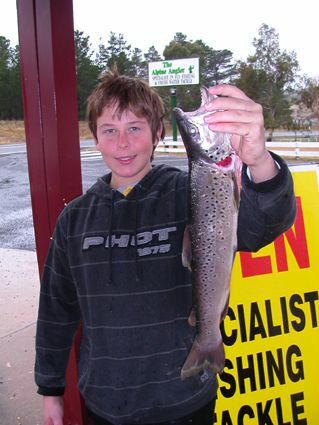 *Yuri and Ryan from Sydney launched at Old Adaminaby and trolled in the rain and the snow for six fish with the biggest being a nice Brown being held in the photo by Ryan. 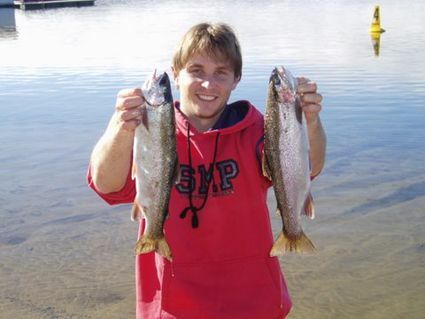 Best lure was the Rapala F9 in Rainbow trout and an even larger unamed minnow worked also. These were all trolled up using lead core. The River mouth and Island areas have been the best places to troll. Kalkite and Hatchery Bay are alsoworth exploring with a few lures. Note, we have 20% off lures this week. * 1800 818 855 to order. *Excludes Tassie Devils and Cobra Style lures. Thought you might be interested in some of these. Trolled around Jindy on Sunday morning and arvo just gone and picked up 6 good fish between 2 and 4lbs, 5 rainbows and 1 brown. Best areas were hatchery bay and around the islands. Dropped a few good fish as well. All taken on Tassies, all yellow wings. Caught them in bright sunshine and dead calm weather....weird! 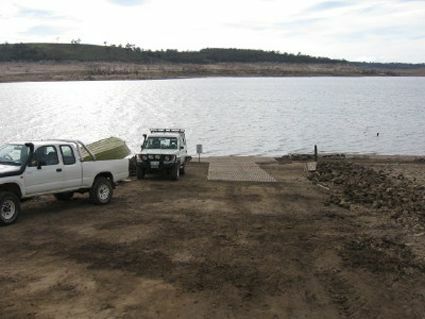 Fished talbingo dam on Friday to Sunday with my mate Scotty, we trolled Friday afternoon with tassies for two nice Rainbows. Saturday was real average, we trolled all morning for one small Rainbow on a rainbow trout spoon on lead line. 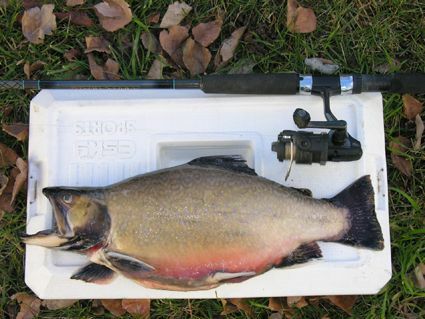 At lunch time we fished the bank with wood grubs for two 45cm rainbows. 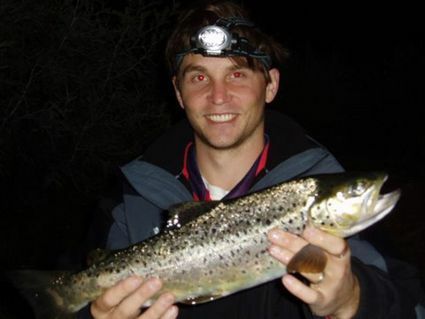 Trolling was terrible Saturday afternoon so we did some spinning from the bank and Scotty landed a 5 1/2 pound 58cm brown trout on a small Rapala. Sunday morning we decided to bait fish and landed another two nice rainbows.